We are less than a week away from the NFL Draft and the excitement is reaching its peak. We all know the “experts” big names and apparent top guys but, I thought I’d go over my personal favorite prospect for each position. Let’s get into this. QB Mason Rudolph, Oklahoma State – By having already written a post about him, I think I’ve made myself clear of what I think of Rudolph. He’s a special talent that is incredibly overlooked. His college numbers were outstanding and he had himself a solid combine. Every time I watched him play in college, I couldn’t help to see raw NFL caliber talent. He’s an underdog who shouldn’t be an underdog. I hope whoever drafts him, gives him the opportunity that he deserves. RB Saquon Barkley, Penn State – I realize this seems like the most generic answer but, I can’t help it. Barkley is the type of player that absolutely steals the show when on the field. More often than not, he didn’t disappoint. He’s a once in a generation athlete and a player that has the capability to immediately make an impact on any organization. I’m so grateful to have witnessed his career at Penn State. Believe the hype, folks. WR’s Calvin Ridley, Alabama & James Washington, Oklahoma State – I simply couldn’t decide who I like better between these two. Therefore, I had to choose them both. Being the most dominate receiver on both of their respective teams, this duo howls with NFL talent. I’m antsy to see them take the field in the NFL. Whoever drafts these guys, will have them on their teams for a very long time. TE Hayden Hurst, South Carolina – I saw plenty of Hurst’s NFL potential as he and the Gamecocks went up against my Gators. Florida, one of the toughest defenses in the nation, looked silly trying to contain this guy. From perfect size to his athleticism, Hurst will certainly be used quite a bit by whoever is lucky enough to pick him up. OT Orlando Brown, Oklahoma – I know, I know, he had a rough combine and struggled at his pro day. I suppose he’ll flop in the NFL now. His college career obviously means nothing if he doesn’t succeed in those, right? Wrong. If anyone thinks otherwise, don’t take them seriously as a football fan. The only reason him struggling made headlines is because the NFL and football in general is desperate for stories right now. Brown had a great career at Oklahoma. Don’t believe it? Watch his film for yourself. There are plenty of solid tackles available but, I want to see Brown succeed the most simply because all the flak he has gotten. He’s an NFL caliber tackle and will certainly help improve any offensive line. It’s hard not to root for his guy. G Quenton Nelson, Notre Dame – My favorite college memory of Nelson was when he made a fool out of LSU’s front seven. If a team has one of their best offensive players at guard, then that team is either awful or that guard is something special. Nelson is special. Considered the safest pick in the draft with no bust potential, Nelson’s a fearless and ferocious talent that will instantly change an O-Line for the best. Don’t be surprised if he’s picked in the top 10. DE Arden Key, LSU – Key is another player on this list that I’ve seen give Florida fits multiple times in the past. Personally, I believe his biggest perks are his strength and speed. Key has great length and can easily snag any ball carrier in his vicinity. As much trouble as he caused for my team, he was a thrill to watch. DT Taven Bryan, Florida – Finally, a Gator. As bias as this may seem, I do think Bryan could very well be the best DT in this draft. In 2017, Taven Bryan terrorized offenses all season long. My favorite characteristic about him is the effort he plays with. It doesn’t matter the sport, if I see an athlete play as hard as they can possibly play, I want to continue to watch for that person alone. Bryan is speed, strength, toughness and determination in human form. I’m beyond thankful for being lucky enough to see him do that in a Florida uniform. OLB Shaquem Griffin, UCF – I think we all know of Griffin and his incredible story by now. Is he the best OLB in the draft? Maybe not. Is he a fan favorite? Absolutely! Griffin blew up in 2017. The guy is an animal. Looking completely unstoppable countless times during his time at UCF, Griffin played out of his mind and proved every doubter wrong and will continue to do so in the NFL. Right now, he is expected to be nothing more than a backup but, that’s according to the “experts”. If he brings the same intensity and determination he had in college to the NFL, I strongly believe he could eventually develop into a starter. ILB Roquan Smith, Georgia – Holy cow. This guy is insane. Smith was a vicious beast in the middle of that Bulldog defense and was a key part of UGA’s national title run. Oh yeah, he played against Florida as well but, that’s all I’m going to say about that for the sake of my emotions. Plain and simple, this guy is destined to be star linebacker in the NFL. He truly has it all. He punishes whoever dares crosses his path and hunts down those who flee. He has an intensity that you just don’t see much in players anymore. I can’t wait to see this guy play on the next level. CB D.J. Reed, Kansas State – Looking for a slot corner? Reed is the man. Don’t let his 5’9 height fool you into thinking any less of this corner. After all, the little guys always seem to play the hardest and with the most passion. Reed is no exception. He’s quick, tough and full of passion. I wish I was able to watch him play more in college because, after watching his career highlights, I’m all in on this guy. He’s surprisingly not talked about much compared to some of the other prospects and to that I scratch my head. Reed is going to be fun to watch on Sundays. 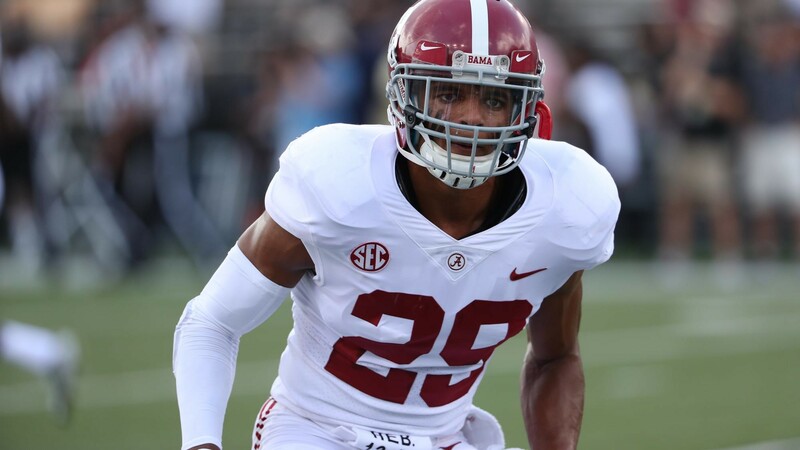 FS Minkah Fitzpatrick, Alabama – I’m not sure if there is another player in this draft that pours his heart and soul into the game of football as much as this guy. Then to have Nick Saban as your teacher? Yup, he’s going to be a star. His competitiveness won’t be topped by anyone on the field and I think that’s what makes him so great at his craft. Fitzpatrick can also be used as a linebacker, slot corner, blitzer and shut down any tight end he’s assigned to. All with ease. I’d be shocked if he isn’t taken in the top 10.